The medical and pharmaceutical industries face great challenges keeping medicines, supplies and organs in a temperature controlled environment. The Department of Defense transports temperature-sensitive munitions to environmentally extreme locations with no good internal control systems. All shippers have a need for point-to-point containers with increased security and credible Tracking Environmental Deviation Systems. 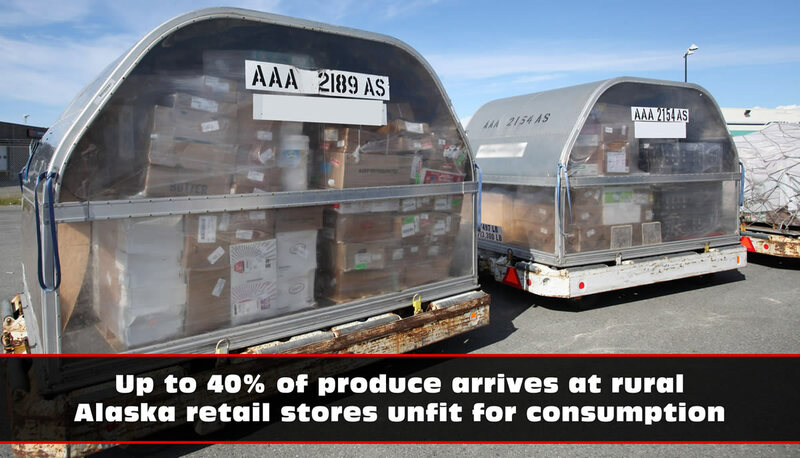 The rural Alaska salmon industry faces significant quality problems that arise from multiple handlings and cargo sitting on the open tarmac between shipments. Global seafood and fresh cut flower industries experience quality loss and chain of custody issues. 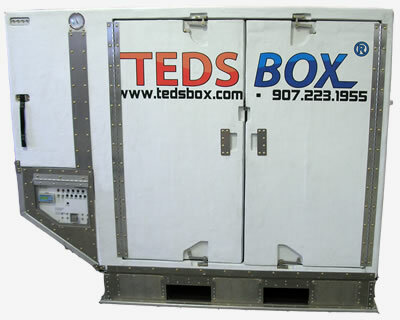 The TEDSBOX® container is a self-contained secure insulated shipping container (aka active cool chain container) with a built-in battery and temperature control system that will automatically maintain a temperature between +32°F (0°C) to +95°F (35°C) using our specified condensor and evaporator system; and if you supplement with dry ice the temperature can be held down to -21°C/-6°F. Temperature monitoring and recording provides a documented history for insurance and chain of custody issues. RFID technology can be applied for remote tracking. The initial product is built to the very common LD-3 specifications, which is grossed at 3,500 lbs. Leasing in Alaska and internationally will be available for infrequent users and carriers. Tednologies, Inc. was created to satisfy the need for proper containers to ship perishable and temperature sensitive products. 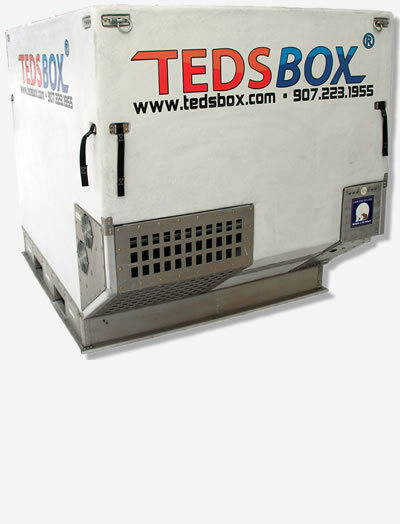 TEDSBOX® was designed around the actual needs of the following perishables markets: pharmaceutical companies, military, foods, ﬂowers, ﬁsh processors, air carriers, commodity forwarders, restaurateurs, and rural Alaska retailers. Now shippers have a complete active Cool-Chain system that’s secure. 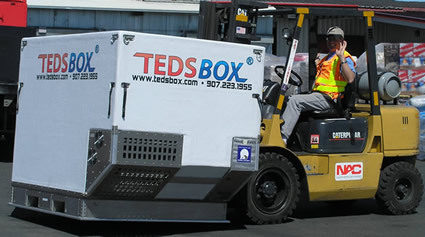 TEDSBOX®is forklift able from two sides and interfaces with a standard pallet jack. TEDSBOX® has rounded corners on inside walls and Gel-Coat finish makes cleaning and inspection simple.  Reduces spoilage costs due to contamination.  One piece design, no pockets for mold or fungus.  Removable batteries to reduce weight.  A custom lip to prevent spillage.  Up to 5 days of battery life.  25% more room inside for product.  The ability to now sell what used to spoil.